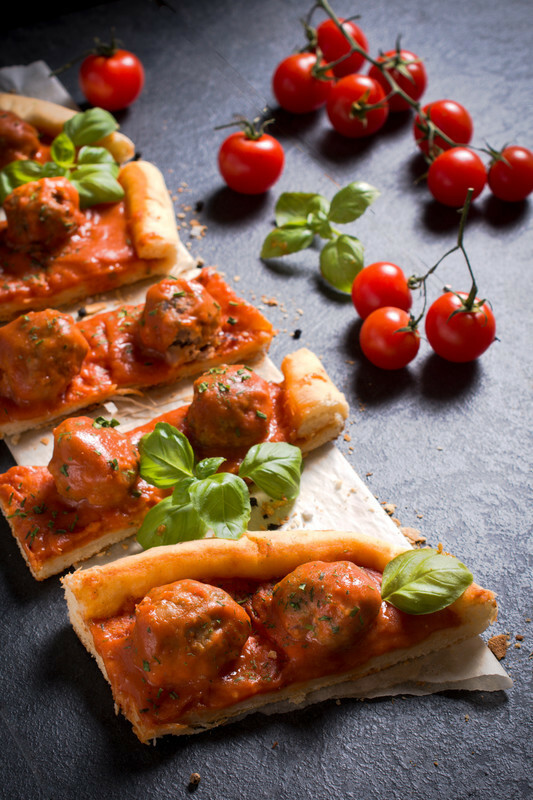 Meatball pizza recipe? Yes, and you are going to love it! Tomato sauce, juicy meatballs and fresh basil. You may also top it with shredded mozzarella before taking it out of the oven. You may also use your favorite tomato sauce for this - it's up to you. Garnish with fresh basil if you wish. Place all ingredients in a saucepan and bring to a boil and simmer until desired consistency if achieved. Remove from the heat to cool. Place in the refrigerator overnight for the best flavor. You may add homemade cayenne pepper if you want the sauce spicy. In a small bowl, whisk the egg and milk together; set aside. In a skillet, heat the canola oil and saute the minced garlic and onion together. Divide mixture in half. In a large bowl, mix ground beef, Italian sausage and half of the onion/garlic mixture together. Add the egg mixture and the remaining meatball ingredients. Mix well and form into meat balls the size of a silver dollar. Place in refrigerator for 15 minutes. PREHEAT oven to 350 degrees to cook the meatballs. You may also fry them if you wish. Bake for 25 to 30 minutes or until no longer pink in the center. Here's another excellent homemade pizza crust recipe. The simpler, the better. Makes two 12 inch pizzas or one large 9x13 inch pan. Dissolve yeast in warm water. Put the flour into a large mixing bowl and whisk in the salt and sugar. Make a well in the flour and add the proofed yeast mixture and oil. Mix the flour in until the dough is soft but not sticky. If it is sticky, add additional flour during the next step. Turn the dough out onto a lightly floured surface (if the dough was sticky, use more flour). Knead for 10 minutes, or until smooth and elastic (dough will "pop back" if you stick a finger in it). Put the dough in a lightly oiled bowl and brush it with oil. cover with a slightly damp towel and put in a warm place. Allow to rise for 1-1/2 to 2 hours or until dough has doubled in size (a hole remains if you poke your finger into the dough). Remove the dough from the bowl and punch it down on a board. Divide into 2 equal balls if you are going to make two 12 inch pizzas, or leave it in one ball to make a large 9x13 pizza. Cover and let rise for 10 minutes. Take 1 ball at a time, roll it out or pat and stretch it into a circle about 14 inches in diameter if using it for two pizzas or shape into a large rectangle to fit into a 9x13 inch pan. Pinch the edge of the dough up to form a rim and place it on the prepared pan (pizza pan or 9x13 inch). Prick lightly all over with a fork. Top generously with sauce, meatballs (and cheese if you are using it). Bake for 25-30 minutes or until the crust is cooked and the cheese is melted. Garnish with fresh basil, if using.